HOUSTON, TX. (Aug. 15, 2018): Justin Hutto was recently given the chance to drive a B/DA Comp Eliminator dragster by former chassis builder, John Green. Following Hutto’s tough start to the season in his father’s Champion Auto Parts powered AA/SA Corvette, this news created a refreshing atmosphere of excitement within the Hutto Racing team. 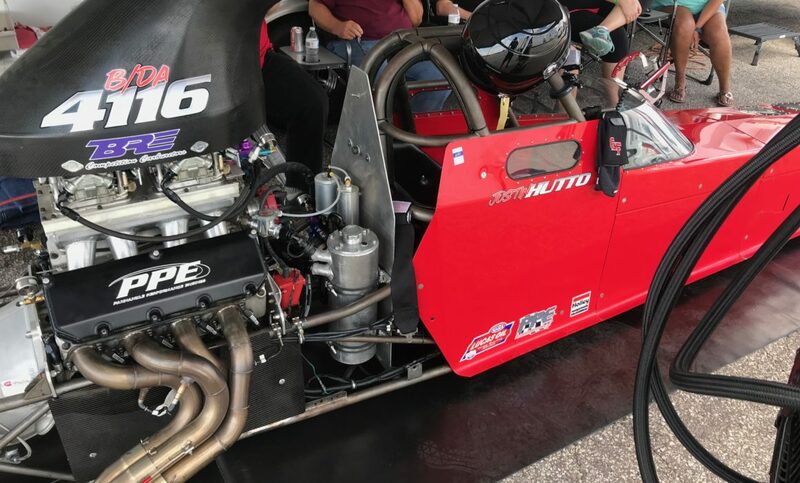 On August 4, 2018, Hutto made his first runs in the John Green built dragster at Texas Motorplex. Throughout the evening, Hutto made a total of three runs in the dragster while battling the infamous crosswinds of Texas Motorplex. On his final run of the night, Hutto was just shy of the 6 second zone as he let off the throttle in an effort to keep the dragster safely in the center of the track. Before this opportunity arose for Hutto, he was actively searching for ways to move up from Stock Eliminator as his goal is to race in Top Fuel. After seeing that John Green was looking for a driver, Hutto took action. He took his time to plan out how he’d make an introduction, then moved forward as professionally as he knew how to. Within two months of that initial communication, this new driver-car owner alliance was formed. Both Hutto and Green have serious plans for success and look to prove that they’re a force to be reckoned with during their three race stretch beginning in Great Bend, KS., Sept. 27-30. To keep up with Hutto and his journey to a professional career in the NHRA, you can follow him on Twitter and Instagram at the @huttoracer handle. About Hutto Racing: Hutto Racing is a multigenerational Houston based NHRA team with a rich history within the sport of drag racing. Starting with Jimmie Hutto Sr.’s founding of Hutto Racing in the mid 1960’s, we have been a successful drag racing team for the past 50 years. Although Hutto Racing spans through multiple eras of the sport, the constant theme throughout the three generations of racers is a devotion to their passion and a resolute work ethic for consistent success. Houston, TX. (June 27, 2018): From his hometown in Houston to Heartland Motorsports Park in Topeka, Justin Hutto’s NHRA Heartland Nationals experience was absolutely action packed. This event provided Hutto the opportunity to win his first NHRA national event after losing at the NHRA Spring Nationals where he stacked a slew of stout reaction times between .000 to .011 seconds. Grabbing a national event win would be a huge step in the right direction for Hutto to achieve his professional racing ambitions. 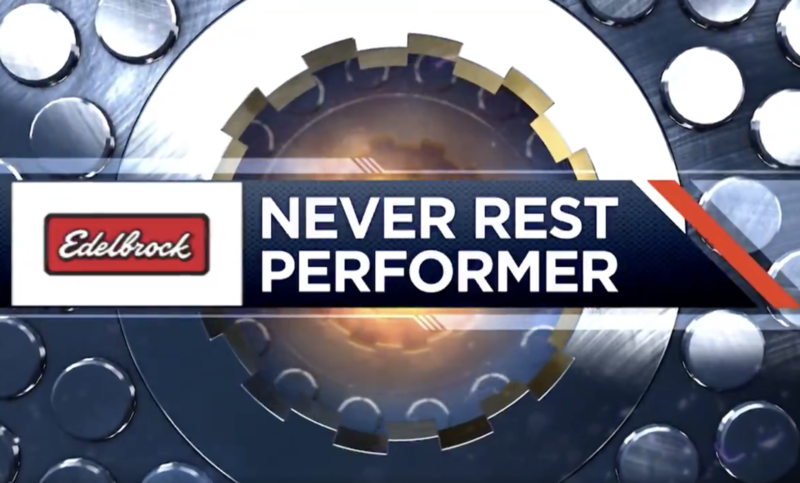 Although Hutto didn’t leave Topeka with an event win, he did leave with the Edelbrock Never Rest Performer Wally as a result of some serious work put in by him and his father, Jimmie Hutto. Hutto’s chance to even compete at this race was almost stripped when Hutto Racing’s owner, Jimmie Hutto had other obligations conflict with the teams racing plans. After a some anxious strategizing by the younger Hutto, a plan was strung up to keep the teams Heartland Nationals hopes alive. The team would test the car in Houston the Friday before race week and Jimmie Hutto would drive the rig to Heartland Motorsports Park the Saturday following that test session. Jimmie Hutto would then drive Justin’s daily driver- which would be loaded along with the racecar into the teams two car trailer- to Kansas City’s Airport and fly to his work destination for the week. Justin Hutto would then fly from Houston to Kansas City International airport, then drive his daily driver that was at the airport to Heartland Motorsports Park on Thursday. Jimmie Hutto would then fly back to Kansas City on Friday evening, then the father and son duo would finish the race and drive back to Houston together. When Friday’s test session in Houston was everything but successful, the teams elaborate plan to compete at the Heartland Nationals was further complicated. 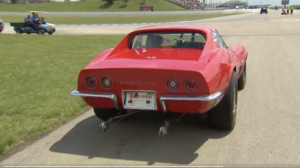 The elder Hutto acted fast by making major changes to the engine of the Champion powered Corvette and loaded the car on a prayer. Even loading the car came with its own set of problems, from the car losing all power, to the new RacePak system malfunctioning. After more than 24 hours of nonstop thrashing, Jimmie Hutto headed to Kansas from the teams Houston shop at about 11 PM Saturday night. Hutto made it to Heartland Motorsports Park after a blistering fast 1o hour dash to meet their gracious female contact- on Mother’s Day morning– that would allow them to park earlier than typically allowed. Days later, Justin Hutto flew out from Houston to Kansas City. Once there, Hutto took a shuttle to the airport parking lot where he came to a heart wrenching realization. He’d lost the keys to his car and the motorhome- the trailer keys were also locked inside of his car. At this point, Hutto’s planned transportation to the racetrack was no longer accessible, and even if he did purchase a $95 Uber to the track, he now had no way of getting the racecar out of the trailer. Perhaps worst of all, he also had no place to stay for the night since he planned on staying in the motorhome at the track which was locked by the set of keys that he lost. As Hutto was searching for airport security, he noticed a gentleman wearing an NHRA shirt. That man would be a savior for Hutto in what seemed like a hopeless situation. Once Hutto explained his situation to this gentleman, he agreed to let Hutto ride to the track with him. Soon after, that same man came up with the idea to break into Hutto’s car at the airport after he noticed one of the rental car company employees carrying a Slim Jim- a tool used to break into vehicles. 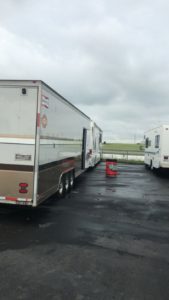 The keys to the trailer were in Hutto’s car at the airport, so once Hutto got into his car, all he had to do was figure out a way to break into the motorhome once he arrived at the track. To add a little more excitement to the situation, Hutto also had a phone interview for an internship during his journey from Kansas City to Topeka with this NHRA safety crewman. Once at the track, Hutto tried to open every window on his motorhome that he could fit through to no avail. Then, without thinking much about it, Hutto tried to open a small window near the door of the motorhome and it was unlocked! By standing on a generator, Hutto reached his arm inside the motorhome just far enough to reach the inside of the door and unlock it! After settling in and having some pizza delivered to the racetrack that he was quite literally stranded at, the young Hutto got his Champion Powered Corvette unloaded and ready for qualifying and class eliminations the next day. The first run down the racetrack was stellar for Hutto, especially considering that the team had no idea how the car would perform after the changes they made the week prior. A 10.055 run would put Justin 23rd out of 51 in Stock Eliminator and also make him the 2nd fastest AA/SA car in the field. After Q1, it was time for class eliminations- a specialty race at some NHRA national events where cars in each class within Stock Eliminator and Super Stock compete in a heads up competition. As Hutto went up for first round of class eliminations against Will Carrell, another hurdle presented itself to the 20 year old. The car wouldn’t start due to frayed battery charger cords preventing the car from charging between runs. After the young Houston racer quickly took a battery from inside his trailer that’s used to power the lift and put it in his Corvette, he hurried through the pits to get to the staging lanes just in time for first round. Following a -.008 red light, Hutto’s class eliminations race was done, but a 10.17 run still gave him a data point to use for first round of the main event the next day. After class eliminations, Hutto chatted with Alan Reinhart: the voice of the NHRA. 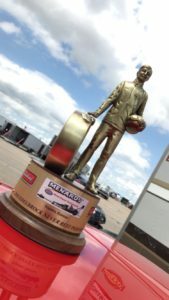 The morning after Hutto shared his story with Reinhart, he got a knock on his motorhome door from NHRA officials notifying him that he’d been selected as the recipient of the Edelbrock Never Rest Performer of the Race award. This netted Hutto a Wally, additional exposure while accepting the award on the return road, and some TV time on NHRA’s Fox Sports 2 program. During first round of final eliminations on Saturday, Hutto left the starting line with a competitive .025 reaction time, but problems set in shortly after. The same misfiring issue that’s been plaguing Hutto for 7 races at this point struck again. After the loss, the team immediately made a sizable investment in a new MSD grid system and installed a new Racepak Drag Dash in hopes of fixing the problem. Follow those upgrades, the team pinpointed their problem as a bad ground somewhere in the car which they’d successfully tackle at their home base in Texas. Today, Justin Hutto is still incredibly hungry to win his first NHRA National Event and has definite plans to compete at the NHRA Fall Nationals in October to do so. To keep up with Hutto and his journey to a professional career in the NHRA, you can follow him on Twitter and Instagram at the @huttoracer handle. Houston, TX. 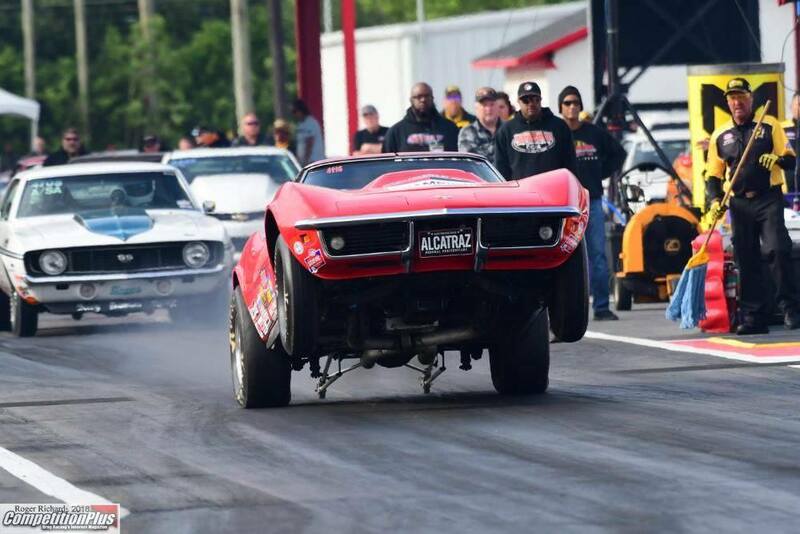 (March 5, 2018): Justin Hutto launched his 2018 National Hot Rod Association (NHRA) campaign at the NHRA Divisional event in Belle Rose, Louisiana in his Champion Powered 1969 Corvette. Coming into the season, Hutto was ready to redeem himself after losing by .003 seconds at the 2017 NHRA Fall Nationals. Hutto also battled with a lingering misfire at the event which left him with some work to do over the offseason. After three months of work, Hutto came out swinging with a Semi-Final finish in Saturday’s gamblers race. In final eliminations of the main event, Hutto snagged the first-round victory over Tim Bartlett with a 9.98 run. In the second round, Hutto paired up against Phillip Giles- a rematch of the final round of Hutto’s first Stock Eliminator win. Hutto left the starting line with a solid .028 reaction time, but slowed a bit too much giving Giles the room he needed for victory. Hutto’s next race will be on his home turf of Houston Raceway Park for the second NHRA Division 4 race of the year.